Festive Friday is a Blog Hop happening the second and fourth Friday of each month, showcasing Christmas projects. The goal is to work on a few Christmas Cards a month so your all ready to mail a gazillion cards by December! If you're joining me directly, you will probably not want to miss the beginning of the hop over at Terris blog. If you've joined me from Brendas blog, You're hoppin' along just fine! A full list of blogs is at the end of this post. Please enjoy your tour of the festivities this week! Sweet & Simple - and maybe one the kids can help with? This one can be made in bulk (haha) pretty easy. Want to translate to Scrapbooking? This would be a great page in a mini album! The cover - with the Year on the little sentiment tag? Increase your dimensions to 6x6 or 8x8 and you'd have a spot in the upper right to add a picture with Santa or a nice family shot in front of the tree! Would be a nice festive Page-in-a-Frame to display at the holidays - 12x12 size would also be great to frame and give as a gift - nice group shot (class, club, friends, or family) in the space to the upper right? Great gift wrap - red wrapping paper, white ribbon and a black paper belt? Cuteness! Door Decoration - the entire door, or a cute plaque in the center? It may be simple, but it's very adorable. Thanks so much for all the great ideas on how to translate it to other things. Great job!!! I love this. Its perfect! I am so going to use this in a scrapbook layout :D Great card! How CUTE is this?! Great card. Thanks for joining us on the Christmas Card Challenges blog this week! 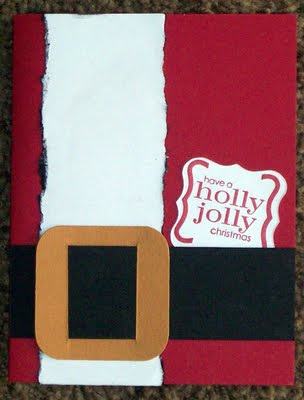 Super cute santa suit card! I love it!